We 'modified' our 2016 MacBook Pro 15-in so it would recognize the AKiTiO Thunder3 PCIe Box as a legit Thunderbolt 3 device. In a preceding article, we demonstrated how the Amfeltec PCIe 3.0 Carrier Board with dual striped SM951 512G PCIe flash blades was transferring data close to 2600MB/s. But there is a fly in the ointment. For the flash blades to be recognized, they must be AHCI. And the Samsung AHCI SM951s are scarce and eBay sellers of used ones are asking astronomical prices. So the search began for an affordable alternative. Bingo! 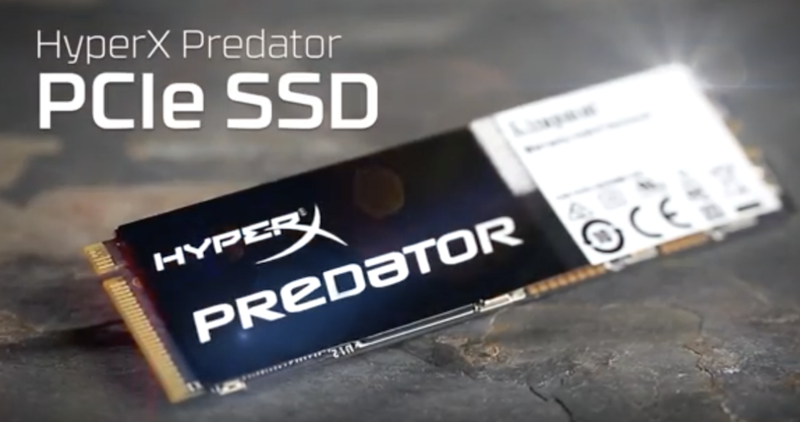 With a help from a reader, we found this: Kingston HyperX Predator PCIe SSD. As you can see, the single SM951 is much faster than the Predator but when you stripe a pair of each, the performance gap shrinks to almost nothing. That's because both pairs 'hit the wall' of real world Thunderbolt 3 speed. Thanks to an alert reader who, like us, was searching for a lower priced alternative to the scarce and expensive Samsung AHCI SM951 flash blade, we learned about the Kingston HyperX Predator PCIe SSD. More Thunderbolt 3 excitement is on the way. The LaCie 2TB Bolt3 Thunderbolt 3 drive rated at up to 2800MB/s will ship in January 2017. The smaller capacity Sonnet 512GB Fusion Thunderbolt 3 PCIe (bus-powered) Flash Drive is rated at up to 2100 MB/s. We look forward to benchmarking both to see if those speed ratings hold up on the 2016 MacBook Pro. And don't forget the BizonBOX 3 eGPU coming later this December. The details are trickling in regarding Apple support of NVMe M.2 PCIe flash blades. One source tells me that the reason our Samsung NVMe SM951 and 950 Pro won't mount is because Apple requires 4K blocks -- which Samsung M.2 blades including the 960 Pro and SM961 allegedly don't support. Once we locate a brand and model of flash blade that DOES support 4K blocks, Sierra's native NVMe drive should recognize and mount it. Stay tuned for updates on this issue. The LaCie 2TB Bolt3 Thunderbolt 3 RAID 0 drive is priced at $1999 and boasts 2800MB/s (available in January 2017 from B&H_Photo_Video). Sonnet Technologies 512G Fusion Thunderbolt 3 PCIe Flash Drive ($799) specifies for Windows only. If we can get our hands on one, we'll try getting it to work under macOS Sierra. Order from B&H_PHoto_Video. Bizon Tech recently announced the BizonBOX 3 GPU Expander (pre-order direct from them empty or bundled with an NVIDIA desktop GPU). AKiTiO will soon release their Thunderbolt 3 GPU Expander called The NODE. We plan to try it as soon as it is available.